Barbarian Press: "Abigail Rorer studied at the Rhode Island School of Design, and is active as an illustrator, using drawing, painting and etching as well as wood engraving. Her work has appeared in books from Houghton-Mifflin, Henry Holt, Little Brown & Company, Counterpoint, W.W. Norton, The University of California Press, and many others, as well as in private press limited editions from Colin Press, Catawba Press, and her own Lone Oak Press. "Abigail Rorer began making woodcuts in high school, and went on to explore with fascination first the wood cuts and engravings of Dürer, and later of the German Expressionists, particularly Ernst Barlach and Ernst Ludwig Kirschner, to which she attributes her penchant for black-line engraving. [Black-line engraving is engraving in which the lines of the image are left raised to take ink, and everything else is cut away; it is the opposite of white-line engraving, in which the image’s lines are incised into the block, and thus appear as white lines when the block is printed." Petersham, Massachusetts: The Lone Oak Press, 2015. Edition of 100. 7 x 9"; 24 pages. Text set in Perpetua. Printed on Zerkall Book paper. Bound by Amy Borezo. Signed and numbered by Abigail Rorer. Lone Oak Press, Prospectus: "One of the greatest tragedies of our time is the rapid extinction of so many diverse species. This new book from Abigail Rorer and The Lone Oak Press is a tribute to four extinct species and an iconic fifth that nearly became extinct. Presented as a portrait gallery, the relief engraved portraits of each species by Abigail Rorer were done in the style of Albrecht Durer's engraved portraits. Included are brief summaries of each species detailing the history of their demise or near demise. "This small book is the precursor to a larger and more ambitious book which will focuses on these five species in depth. The publication date should be sometime in 2016, if all goes well." The five species in this work are the dodo, the southern gastric brooding frog, the western black rhinoceros, the passenger pigeon, and the American bison. Petersham, Massachusetts: The Lone Oak Press, 2015. Edition of 300 (260 standard, 40 deluxe). 7 x 9"; 32 pages. 25 engravings. Printed by Patrick Randle at Nomad Letterpress in Whittington. Set in 14-point Van Dijck on Zerkall mould-made paper. Signed by Rorer and Macgregor. Numbered. Standard (250 copies): Quarter cloth spine with paper over boards decorated with an engraved design, in a slipcase. Deluxe (40 copies): Bound in Oasis goatskin with a special leather hinge design and endpapers by Abigail Rorer plus a portfolio of proofs of the engravings, in a solander box. The Lone Oak Press, prospectus: "The small church in the Gloucestershire village of Whittington in the UK has been part of the backdrop of British wood engraver Miriam Macgregor’s life since she lived, until recently, and still works in the village of Whittington. Miriam is an integral part of the Whittington Press, working with John Randle and providing illustrations for numerous books in addition to creating her own books, most recently Midwinter which chronicles a snowstorm in the village. American engraver, Abigail Rorer, came to know the church and village during her visits with Miriam and the Whittington Press after attending a number of Oxford Fine Press Book Fairs. "The idea of a small illustrated collaborative book on the church was mutually conceived because both artists were drawn to the great age of the church and the beautiful sculptures, architectural details, and centuries of change and decay inherent in such an ancient building. Miriam has engraved the exterior images of the church and Abigail has engraved the interior images. The church abuts Whittington Court and Whittington Press and sits there alone in serene and quiet dignity seemingly ignored by all the daily comings and goings around it. "The text [is] a walk through and around the church with personal commentary, historical facts, and anecdotes." Abigail Rorer, prospectus: "At the back of the church on the left is a large stone Norman arch with two carved corbels, a type of bracket, opposite one another on the inner side of the arch. The far one is a male head and the near one is a female head. Miriam chose to engrave the male and I chose the female. The sculptures are believed to have been done in the 1400s since the woman's horned headdress, or hennin, was the fashion of that time. It is probably safe to assume that they were man & wife. "The extraordinary thing about these two figures is that they are smiling. They seem quite happy in a very benign and contented way. The smiles bring them out of the realm of being merely cold stone sculptures and give them a humanity and contemporaneity. It makes me realize that human nature hasn't changed in the past six hundred years; their thoughts and emotions were probably very much like ours." Petersham, Massachusetts: The Lone Oak Press, 2011. Edition of 60. 6.5 x 11"; 32 pages. Set in 14-point Monotype Van Dijck by Michael and Winifred Bixler. Illustrated with seven multi-color engravings. Typography and printing by Michael Russem. Printed on Zerkall papers. Binding designed by Daniel Gehnrich and done by Amy Borezo. Title tipped in on spine of clamshell box. Edition of 60 with 14 deluxe and 41 regular copies. Deluxe: Special binding with an extra suite of prints, an original watercolor of the plant, a herbarium specimen sheet, and a short essay about attempting to grow Eritrichium nanum. Regular: Bound in paper and leather over boards. Laid in cloth covered clamshell box. Lone Oak Press: "In the book Mimpish Squinnies, The Lone Oak Press focused on fourteen plants that British plant explorer Reginald Farrer (1880-1920) disliked with a passion. In this new book, we join Farrer on a journey to the Alps in his quest to see in situ one of his most beloved plants, Eritrichium nanum, also known as The King of the Alps." Abigail Rorer, from the Introduction: "Farrer's description of Eritrichium nanum appears in the two-volume set of his The English Rock Garden (1918); his first adventure seeking the plant in the Alps is from My Rock Garden (1907) and Among the Hills (1911). I have taken liberties in piecing together the texts. My apologies to Mr. Farrer." Petersham, Massachusetts: The Lone Oak Press, 2009. Edition of 100. 4.5 6"; 16 pages with color endpapers. Designed by Pat Alger and Abigail Rorer. Four color engravings by Abigail Rorer. Letterpress printed. Deepdene type. Printed on Zerkall Book paper. Hand-sewn Rives wrappers. Cover illustration of a two-block color engraving. Slipped into a transparent envelope. This printing of Christmas Trees commemorates the eightieth anniversary of the first Robert Frost Christmas card. Includes an afterword "A Commemorative Christmas Story" by Pat Alger. Petersham, Massachusetts: The Lone Oak Press, 2009. Edition of 66. 6.75 x 7.25"; 12 pages. 4 engravings plus two smaller spot engravings, all by Abigail Rorer. Typography and text printing by Michael Russem. Perpetua types cast by Michael and Winifred Bixler. Letterpress printed on Zerkall paper. Bound in Twinrocker Simon's Green paper. Binding by Daniel Gehnrich. Paper slipcase. Edition of 66 copies of which 46 regular copies and 10 deluxe copies are for sale. The Lone Oak Press: "The poem in this chapbook was written by Abigail Rorer to commemorate a magnificent White Pine growing in the protected woods behind her house where she frequently walks with a friend. She draws parallels between the aging of this tree and her attempts to reconcile herself with her own aging." Petersham, Massachusetts: 1990. Edition of 120. 5.75 x 8"; 24 pages. Printed on Japanese Mulberry with six wood engravings by Abigail Rorer. The type is Cochin. The text and engravings were printed by Darrell Hyder. 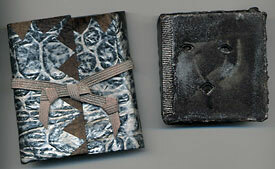 Marbled papers by Faith Harrison were sewn in a Chinese style binding with a magnetic case by Barbara Blumenthal. Edition of 120 with 110 for sale, 10 deluxe (sold out) and 100 regular copies. The Lone Oak Press: "This is a beautiful and haunting poem of war and desire. Christopher Howell, who lives in Spokane, Washington, is a widely published, widely traveled and much honored poet whose works reflect the human experience with all its loneliness and beauty, love and desolation. His poems touch the chord of reflection and quiet we experience in rare moments of aloneness." Petersham, Massachusetts: 2005. Edition of 70. 10 x 8"; 92 pages. Includes 28 wood engravings by Abigail Rorer, some with hand-coloring. Book design by Michael Russem of Kat Ran Press. Printed on Zerkall Book paper. Bound by Barbara Blumenthal with marbled papers by Iris Nevins. Type is Baskerville, cast by Michael & Winifred Bixler. Bound in morocco leather with marbled paper sides. Housed in a clamshell case. "Woodland pools, spring-holes and ditches are all terms used by Henry David Thoreau to describe vernal pools; ephemeral springtime wetlands that often dry up in the summer and are vital breeding habitats for many species ranging from wood frogs, spadefoot toads, spotted salamanders, and fairy shrimp. In New England these pools are an important part of the landscape and the rites of spring. One sure sign of spring is the call of the spring peeper, a diminutive tree frog that breeds in vernal pools. In Thoreau’s journal he often mentions these frogs: Where so long I heard only the brattling and moaning of the wind, what means this tenser, far-piercing sound? All nature rejoices with one joy. If the Hyla (spring peeper) has revived again, may not I? March 21, 1853"
Thoreau plus Rorer is a marriage made in Concord, which might be heaven, from the description and look of it.